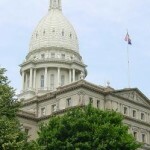 The Michigan House of Representatives introduced a package of bills to repair several major problems within Michigan Unemployment Insurance Agency. According to a Gongwer report, the bipartisan legislation was the outcome of a large workgroup consisting of Republicans, Democrats, business, labor, experts in unemployment benefits and the MI Unemployment Agency, which spent close to 900 hours drafting the the bills. Reducing penalties for fraud from four times the benefits received to an amount equivalent to the benefits received on the first offense and 1.5 times the amount received on subsequent offenses. Identity theft penalties would remain four times the benefits received. Allowing anyone accused of fraud to have a state-funded advocate assist them through the process, something currently barred, though if the individual is found to have committed fraud they have to repay the state for the advocate’s service. No longer requiring those improperly given benefits to pay interest on those benefits if the error in awarding benefits was made by the agency. Clarifying language to assure the agency awards hardship waivers to those who received an over-payment but did nothing wrong and have income below the federal poverty level so they do not have to pay the benefits back. Allowing an employer and employee to sign an affidavit together stating an unemployment benefits claim filed by someone else in the name of the employee was identity theft. The agency currently lacks mechanisms to address this growing problem, business groups have said. Better notification to those accused of committing fraud. A committee hearing on these bills is expected soon. The MAB is monitoring.